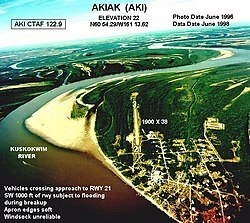 Akiak is a city in Alaska. ↑ "Directory of Borough and City Officials 1974". Alaska Local Government (Juneau: Alaska Department of Community and Regional Affairs) XIII (2): 12. January 1974. This page was last changed on 13 June 2018, at 02:26.